Leading Manufacturer of aluminum cap sealing machine, milk storage tanks, syrup blending machine, depyrogenation tunnel, automatic adhesive tape slicing machine and linear tunnel type bottle washing machine from Thane. We are instrumental in providing our clients a comprehensive range of Aluminum Cap Sealing Machine. The offered cap sealing machines are manufactured in a proficient manner with supreme quality raw material and highly advanced technology in sync with the latest market standards. These cap sealing machines are precisely inspected on each part so as to deliver perfect range to our customers. Also, these cap sealing machines are available with various specifications at market leading rates. We have gained the expertise in manufacturing, exporting, distributing and supplying of Milk Storage Tanks. Our complete range of milk storage tank is designed with top quality of material in accordance with the market norms. The offered milk storage tank is broadly applauded for its quality long life also examined on quality parameters for ensuring its flawless range. Clientele can purchase the whole range of milk storage tank at pocket friendly rates. 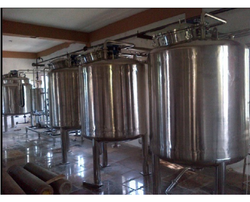 By keeping track with the market developments, we are involved in offering Syrup Blending Machine. Our offered item is developed under the management of skilled professionals according to the set industry norms by utilizing the quality proven basic material. For ensure their quality, the complete range is severely checked on diverse parameters. Offered item is accessible in various stipulations and is also provided in customized options for gaining the complete satisfaction of our customers. CIP Spray Ball for Tank Cleaning. Inlet/Outlet connections. Unipack is leading supplier for Pharmaceutical Depyrogenation Tunnels, which are particularly used in food & beverages, cosmetics and pharmaceutical industries. Our design of tunnel meets the cGMP norms and operation of same is automatic through PLC and touch screen HMI. The Tunnel is consists following zones. The Drying zone :This is the first zone between vial washing and stabilizing zone , the drying zone creates thermal barrier to protect the vials from contamination and pre heat the vials say 80-90 degree centigrade temp.. For some hot air, the pressure difference is adjusted to flow from sterilizing zone to preheating zone. Hence, drying and pre heating of the vials take place. The sterilizing zone:After passing from Drying zone, vials are passed through sterilizing through controlling air velocity and gradual rise in temp. wire mesh conveyor speed is set so that all vials get heated up uniformly up to 350 degree centigrade temp. Hot air is blown through turbine blower to distribute uniformly hot air jet through Hepa Filters provided at appropriate place and length of sterilizing zone is such that all vials temp. 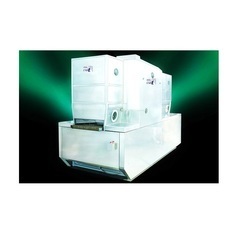 set at any level below 350 Degree Centigrade, the sterilizing zone can be heated. The air velocity can be adjusted. To obtain a Log-3 pyrogen reduction accordingly, the thermal cycle is designed. Vials enter into cooling zone from sterilizing zone where they are subjected to cold laminar air for lowering the room temperature. Through exhaust blower fitted down the belt, the hot air can be exhausted. To maintain negative pressure in washing room and filling room, the stabilizing zone with cold laminar air flow stabilizing zone is used. The Control panel S.S.304 is designed such that all set parameter controls through PLC. Interlocking and safeties are provided at for smooth operation of tunnel. Temp. indicators and air velocity dial gages are mounted on tunnel to see the status of different zones while tunnel is in operation. For higher thermal efficiency & power saving, thyristorised temperature control unit is used. For dehydrogenation & on line sterilization for washed vials & ampoules, stericlean hot laminar flow sterilization tunnel is used for washed Vials and Ampoules.Class-100 laminar air flow throughout drying, sterilizing, cooling & stabilizing zoneThyristorised temperature control for high thermal efficiency & Power Saving with uniform temperature in hot zone Automatic Control Through PLC and online printing. Our new developed automatic adhesive tape slicing machine is user friendly and new added features in the machine gives better yield of product sliced from log roll and ultimately it results in to improved productivity. Machine is provided with imported servo drive and touch screen HMI gives consistent performance of machine. A) Imported servo drive for circular blade cutter feeding with interlocking and safeties. B) Main pitch shaft drive motor which imported and gives precision and consistent slice width of product. C) Main drive motor 5 HP variable frequency drive to control drive of log roll to infinite speed control. Application: Slicing of PVC adhesive tape like foam, masking tape, double sided tissue tape, Polyester tape etc. Features: High precision cutting width, user’s friendly, servo motor for pitch shaft as well as cutter assy.Circular knife is driven by infinite speed control through variable frequency drive. Variable speed controller for machine main shaft. Circular cutter provided with dual cooling by liquid as well as moist air.Utilities requirement- Dry air at 6 bar 5 CFMPower- 7 Kw 415 volts, 3 Phase, 50Hzwith ear thing.Machine is self supporting and does not call for foundation with height adjusting bolts and floor plates.Machine can adapt without extended core log rolls to get better yield of sliced product.Operation of machine is automatic through PLC and touch screen HMI.Diff. slices width facility in PLC so that without stopping machine desired width of slice can be possible. 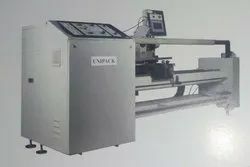 Unipack machine is Pioneers in designing, mfg. and supplying automatic tunnel type linear bottle washing machine. Machine is design is very user friendly and does not call for major maintenance. Our latest design of machine well accepted by our esteemed customer due to flexibility in adopting different size of glass well as pet bottles ranging from 15 ml to 500 ml with minimum set of change parts.All critical parts are mfd. on CNC machines for smooth operation of machine. MOC Machine is mfd. in SS 304 including main machine structure, optionally liquid contact parts will be provided with SS 316 Material. Spray Nozzles Pressurized high efficient spray nozzles ensure effective cleaning of each bottle for internal wash and external wash cycle. Interfacing with other equipments Machine can be interfaced with pre and post equipments without major change in equipment. Foundation Machine is self supported and does not call for foundation, machine is provided with height adjusting bolts and floor plates in SS 304 MOC for better stability and vibration free operation of machine. Energy efficient drives All drives like motors and other drives are energy efficient and with low Noice level. Validation Bottle washing machine will cover Technical manual consisting of details for preventive maintenance, consumable spares required, material analysis test reports issued by approved laboratories, with OP, PQ ,SAT etc is the part of document. Soft copy of same will be mailed you for future reference. Looking for Packaging Machinery ?